Italian sprinter Alessandro Petacchi has made the decision to call “a pause” to his 18-year career as a professional cyclist, with a statement made via his Lampre-Merida team. The 39-year-old from La Spezia, nicknamed the “Ale-Jet” because of his speed and “the Gentleman” because of his professed dislike of the physical side of the rough and tumble of bunch sprinting has been part of the elite peloton since signing for Scrigno-Blue Storm in 1996, and has racked up close to 200 wins in some of the biggest races in the sport. Petacchi made his big breakthrough in 2000, when he signed for Fassa Bortolo and, while a stage of his native Giro d’Italia eluded him, he took two stages in that year’s Vuelta a España; his first in Grand Tours. 2003 was by far his biggest year, however, as he finally took that Giro stage, then added an incredible five more; he then took four stages of the Tour de France, and five in the Vuelta, to make a total of 15 Grand Tour stages in the season. The following year he took an extraordinary nine stages in the Giro, his total of 22 in all years puts him ninth on the all-time list alongside the legendary Fausto Coppi. In addition to his stage wins, Petacchi took the victory that all Italians dream of in 2005 as he outsprinted the peloton to take the Milano-Sanremo. 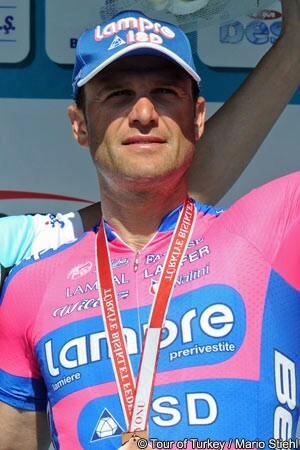 Petacchi’s career has not been without controversy, however, as he tested positive for high levels of salbutamol in the 2007 Giro; he was sacked by his then Milram team and - partly retrospectively - suspended for almost a year. As recently as 2010 Petacchi took two stages of the Tour de France, and won the green points jersey, but victories have been far harder to come by in recent years. His success was limited to three stages and the points jersey of the Bayern Rundfahrt last season, and - although he started 2013 with the intention of proving that he still had the speed in his legs - he has taken the decision to call a halt to his long career. “Paris-Roubaix closed an early part of the season in which I raced a lot, trying to be protagonist in traditional appointments, such as Milano-Sanremo, and in competitions less usual for me, like Paris-Roubaix. I approached all these races in a completely professional way, driven by the enthusiasm that the Galbusera family [the team owners - ed] and the new sponsors gave to the team. I’m aware I gave my best, as I always did in my 18 seasons as professional cyclist. My career has been full of satisfactions and enriched by all the most important victories that a rider like me could ever have aimed for. At the threshold of the 200 victories in career, I feel my life reaches a peculiar moment, a turning point in which I feel the need to find a new dimension and to have more time to dedicate to my family. These considerations have induced me to make the decision to pause my career. I always put the professional side of my job first, honouring the efforts made by sponsors, such as Lampre, Merida and all the other partners of the team; I really thank them for the trust they gave me in these marvellous years. I feel it’s time to dedicate time to myself and to go in search for new challenges. For now, I want to say goodbye to all the cycling fans, considering that maybe there will be the chance to come back some day and be part of the world that gave me so much, offering my experience to new cycling generations. I’d like to thank the team, the sponsors, the management, the staff and athletes, and everyone that supported me during my career, always confirming my availability to support, when necessary, my teammates and the team with the knowledge gained in my experience.